Wow. You knew just what to draw to immeadiatly improve my mood! Cute! He's angry because a mammouth just stole his watermelon. These are awfully charming, and quite good. Thanks for taking time to tend to the blog. I'm afraid you've created a little monster that must be fed. He's not amused because he's just found out that modern day people call him a dodo? Awesome that it's in colour! To misquote the late, great Carl Giles: It wouldn't be a very good idea to make a comeback looking like a turkey just before Christmas! Apparently they didn't taste very good, but got driven to extinction anyway. Not enormous in the brain department either. Random dodo facts. Did you by any chance use the stuffed dodo at the Natural History Museum as a reference? Because I have a picture of me with that dodo (don't ask...) and it has the exact same expression. Just catching up on these, which is much healthier than when you forget to eat your chocolate calendar offerings for days on end and yet more fun, too. 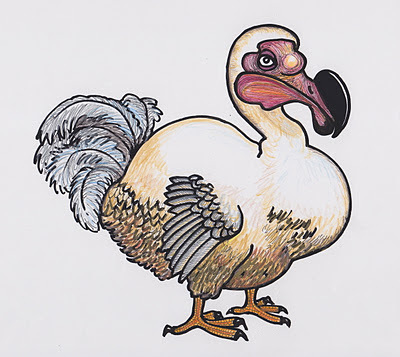 Is the dodo's face consciously or fortuitously very Van Gogh? It's as though a sun is setting above his beak.